How much does Bryant and Stratton College - Virginia Beach charge for tuition at this time, and how much are charges estimated to shift? How do these charges rival other colleges? Read on to find out. Find out how tuition and fees at Bryant and Stratton College - Virginia Beach measure up to the average and see what you can do to successfully get ready for probable tuition growth. The next table shows how Bryant and Stratton College - Virginia Beach compares to other colleges nationally, regionally and by state. Full-time undergraduate students at Bryant and Stratton College - Virginia Beach paid $16,893 in tuition and fees in the 2017 - 2018 academic year, before modifications for financial aid. Of that number, the price tag on tuition came to $16,646. The other $247 are added fees. Unlike state schools, Bryant and Stratton College - Virginia Beach doesn't provide reduced tuition and fees to residents of the state. Tuition and fees take care of the expense of attendance for one year of school, but do not cover room and board, which is an added bill you will incur if you decide to stay on campus. Bear in mind a lot of students will get financial aid and scholarships that decrease their total cost. How much does Bryant and Stratton College - Virginia Beach cost per credit hour? Find Bryant and Stratton College - Virginia Beach cost per credit hour here. There continues to be a rise of 4.1% in Bryant and Stratton College - Virginia Beach tuition and fees for out-of-state students in the past five years. Tuition expanded by 4.0% and fees expanded by 12.5%. This school year, undergrads can expect to pay $17,579 if the growth keeps up. Due to price growth, the total expense of a four-year degree from Bryant and Stratton College - Virginia Beach would be $74,715, and the total cost of a two-year degree would be $35,871, which doesn't include added charges for books, transportation, and room and board. 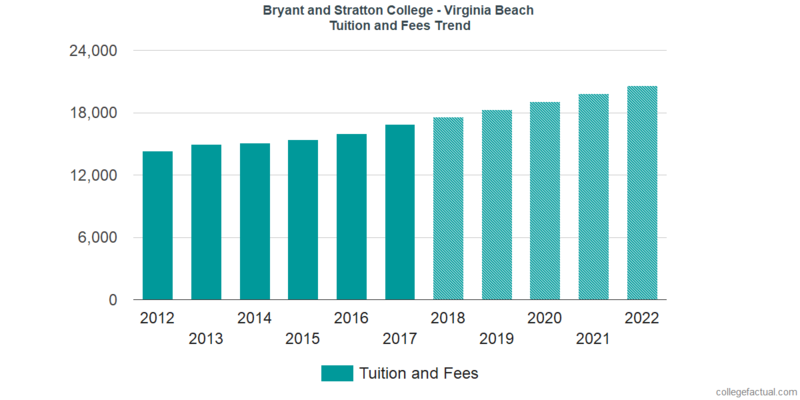 Look at the following chart to discern how Bryant and Stratton College - Virginia Beach tuition and fees may increase in the years to come. Be aware of just how much the tuition and fees are rising yearly. At many colleges undergrads will wind up paying a larger price for their last year of school compared to what they did for their first.